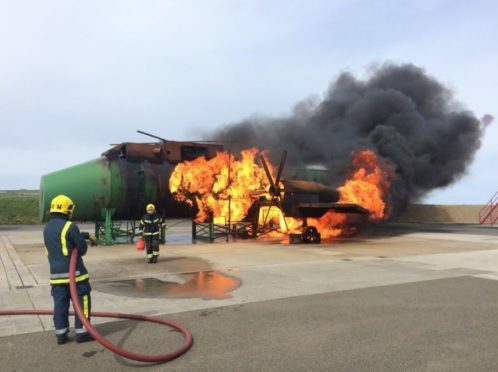 A new £1.2 million fire training facility at Kirkwall Airport was officially unveiled yesterday. The facility, opened by Scottish Fire and Rescue Service (SFRS) chief officer Alasdair Hay and chairwoman of the SFRS board Kirsty Darwent, will allow firefighters the opportunity to train in a carbonaceous environment where fires can reach temperatures of up to 600C. SFRS Chief Officer Alasdair Hay said: “Today’s official opening marks the culmination of a long-term strategic plan to deliver a truly outstanding facility for our firefighters across Orkney. “This significant investment will provide our firefighters with the modern resources and training required to keep standing on that front line and I commend their unwavering dedication. The new training unit at Kirkwall Airport – with work from Highlands and Islands Airports Ltd (Hial) – comes a year after a similar £3million facility opened in Stornoway as the SFRS work towards supporting their retained firefighters across Orkney, Shetland and the Western Isles through significant investment. Annabelle Ewing MSP, Community Safety and Legal Affairs Minister, said: “This successful continued partnership between the SFRS and the Highlands and Islands Airport Ltd is excellent news for communities and firefighters alike.